Make homemade herbal teas and herbal infusions using these clear instructions. This article includes a list of tea-making herbs and their healing properties. 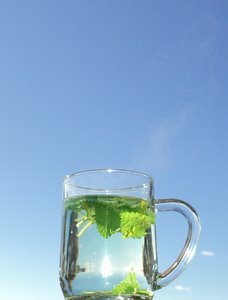 Many herbs lend themselves well as the main ingredients in medicinal teas. You can use a starter tea such as Green Tea (Camelia sinensis) and add herbs to it, or you can just use other herbs by themselves. For those who do not wish to have caffeine in their hot drink, decaffeinated Green Tea is available. The benefits of Green Tea are numerous and well-known, so this is an excellent option for many of us non-caffeine drinkers. Green tea is favoured over black tea because it is not fermented, but rather steamed after the leaves are dried. Fermentation changes the taste and composition of the tea leaves whereas steaming keeps them as close to their raw state as possible. Your choice of herbs for making herbal teas will depend on which healing process you wish to enhance with tea-drinking, see below for suggestions. With your supplies ready, choose the herbs, fresh or dried, that you would like to use for your homemade herbal tea. Measuring for one cup of tea, set aside one small handful of leaves if the leaves are relatively large, or 2 to 3 sprigs if the leaves are small, about one tablespoon. For large leaves, gently tear them to help the phytochemicals to dissipate more easily into the water. For each cup of liquid needed, use two cups of water. Bring the spring water to boiling point in your kettle, and remove from heat. Place herbs in the teapot, pour hot water over them and cover tightly, containing the volatile oils inside. Leave to steep for at least five minutes. Pour into teacup with strainer and add honey or other sweetener to taste, if desired. If you are treating a cold or a cough, it’s best to drink the liquid while it is still hot. The only difference between a tea and an infusion is the length of time the mixture is left to steep after adding the water. For an herbal infusion, which brings out the herb’s chemicals in a much higher concentration, leave to steep for a minimum of twenty minutes. Another method is to leave the teapot to steep indefinitely, pouring the strong liquid into your cup or mug and sipping on it during the day. Sedative, helps to calm and induce sleep; has anti-cold and anti-flu properties. Immunity-enhancer, anti-flu, take only for three weeks, then stop taking for two weeks. Do not give to children under two years of age or to anyone who has asthma. Leaves have anti-inflammatory, anti-flu and many other health-enhancing properties. Sedative, helps to calm and induce sleep; has anti-depressive and anti-anxiety properties. May be used as a tonic; has cleansing, antioxidant and antibacterial properties. Soothes stomach problems and helps with pain. Also have anti-flu and anti-bacterial properties. Do not give to children under six years of age. Helps the body produce moisture, i.e., dry eyes; helps stimulate the appetite, and has anti-bacterial and anti-fungal properties. Take only for three weeks, then stop taking for two weeks. (Use flower tops and a few leaves)Has anti-inflammatory, anti-bacterial and sedative properties; also soothes stomach problems. Has anti-cough and anti-flu properties. Helps with pain (anti-inflammatory), digestion and stomach problems. May be used as a tonic, as it has many healthful benefits, anti-flu being one of them. Has many anti-flu and anti-bacterial properties; also used to calm down allergy symptoms, such as hay fever and environmental allergies. Same as Oregano, and helps the memory. However, take only for three weeks, then stop taking for two weeks. Helps calm a cough, has anti-flu, anti-bacterial and anti-allergic properties. Please read this important caution about the safe use of herbs if you are pregnant, have asthma or allergies, have a thyroid problem or if you are thinking of giving herbal teas or infusions to a child.